The modern movement in architecture came late to Ireland and while there were a few buildings of significance completed before the second world-war, the impact of international modernism was largely felt after the war – the work of Mies Van Der Rohe and Le Corbusier being of particular importance in this regard. 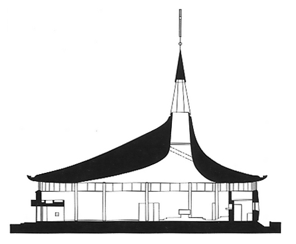 The name that stands out as the central figure in the development of modern church architecture, not just in Ulster but in Ireland as a whole, is that of Liam McCormick. Over a period of four decades this gifted architect was responsible for an impressive series of outstanding churches, many of them were built in his own home county of Donegal. His most famous example is the RIAI Gold Medal-winning Church of St Aengus at Burt which was to bring him unprecedented acclaim and lead to his eventual international reputation. This lecture will examine the influence of le Corbusier in Ireland with a particular focus on the church architecture of Liam McCormick and the significance of a sense of place in his work. Liam Kelly is a Professor of Irish Visual Culture at the School of Art and Design, University of Ulster, Belfast. He holds a BA (Hons.) degree in the History of European Art from the Courtauld Institute of Art, University of London, and a Ph.D from Trinity College, Dublin. He is a writer and broadcaster on contemporary Irish and international art. His publications include Thinking Long – Contemporary Art in the North of Ireland; The City as Art (ed.) and The Disembodied Eye. He has also curated both solo and thematic exhibitions in Ireland, Australia, USA, France, Slovenia and Hong Kong. This lecture will take place at the University of Ulster, Belfast (Art College) and is open to non-members. Lecture fee: £7.